Move-in READY! 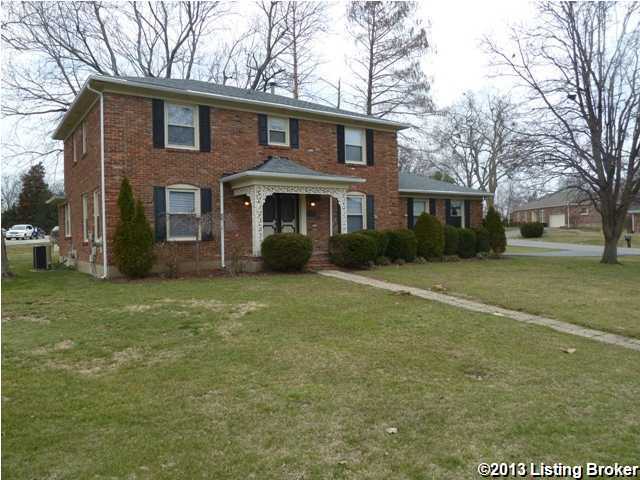 Home sits on a large beautiful corner lot with fresh paint throughout and new carpet. The second floor has hardwood. The family room has hardwood floors, built-in bookcases, a fireplace with gas logs and French doors leading out to a nice shady deck. HVAC only 5 years old, shingles on house and garage are 6 months old. Replacement windows throughout. Sellers are providing buyers a one year home warranty. Douglas Hills has a private 8 acre park with walking trail, tennis courts, playground with equipment and an optional swim club membership. Douglass Hills is a subdivision within the city of Louisville, Kentucky. There are currently 2 Homes for Sale within Douglass Hills, with asking prices ranging from $94,900 to $289,900. The average list price per square foot of the available inventory in Douglass Hills is $121, which is below the Louisville average of $155. The Average Sales price of all sold real estate in this subdivision for the past year is $259,881. Recent comparable homes have been selling for 97.93% of their asking price. Waterfront homes represent 0.00% of the available Douglass Hills inventory. The population of Louisville, according to the 2010 Census, is 597,337. The total number of households in the zip code of Douglass Hills is 4,595, with an average household size for of 2.20 people. The total number of renter households within the zip code of 40243 is 1,328, which means that 71.10% of households in this zipcode are owner occupant households. 200 Burnsdale Rd, Louisville KY 40243 is a Home, with 4 bedrooms which is recently sold, it has 2,339 sqft, 0 sized lot, and 2 Car Garage,Entry Side parking. A comparable Other, has bedrooms and 0 baths, it was built in and is located at and for sale by its owner at $ 0. This home is located in the city of , in zip code , this County Other, it is in the Subdivision, and CROSSCREEKE are nearby neighborhoods.